TEA DRINKING- A POTTED HISTORY. There is probably nothing linked more strongly to the British than their love of tea drinking. And certainly nothing more quintessentially English than the custom of taking afternoon tea from elegant and beautifully decorated teaware, a pleasure we have enjoyed for over 350 years. Yet tea was not the first or only drink to arrive at our shores from exotic, faraway places. We had already become familiar with coffee and Chocolate just a few years before China tea became the preferred drink- certainly of the rich- who were the only people wealthy enough to afford this luxury when it first appeared. Here is a potted history of beverages in the 17th century and onwards and how tea became a firm favorite with the British, a tradition that remains unchanged today. Both coffee and chocolate were introduced into England in the early to mid 1600's. Coffee, from Turkey initially, via Europe and Chocolate from Mexico via Spain and on to England. Both proved popular and brought about the first ‘Coffee Shop’ being opened in 1652 serving not only coffee but also chocolate, brandy, ale and wine .These Coffee Houses also called penny universities were patronised by Men only-business men, politicians, travellers, poets and socialites who met not only to take refreshments but also to do business, pass on knowledge, debate the questions of the day and pass a leisurely hour or so in the company of like minded aquaintences. Edward Lloyds establishment was such a hub of business that it eventually became Lloyds of London Insurance Company. Tea came to England in the 1660's. King Charles II’s queen, the Portugese princess, Catherine of Braganza, was already familiar with tea drinking as Portugal had started to import tea some time earlier. She stirred her husbands interest in it and in 1664 The East India Company put in an order for 100lbs of China tea to be imported from Java. Tea soon became the favorite beverage at court, this soon spreading to the wealthy families and then onto the coffee houses. However, tea drinking was not a cheap pass time by any means. In 1689 a tax was levied at 25p in the pound which almost caused a halt in tea sales. However this was lowered to 5p in the pound by 1692, when Thomas Garway’s establishment was advertising tea at £6 and £10 per pound!! Certainly not the poor man's drink. As with coffee and chocolate, tea also had its own particular utensils for preparing, serving and drinking. When the East India Company commenced the import of tea it also imported the tea ‘pots’ for preparation, and the deep sided ‘saucers’ and handleless ‘cups' that the Chinese used. These were of fine quality in comparison to the earthenware items in use in England at that time. English potters were struggling to find any medium to compare to the porcelain made in China. 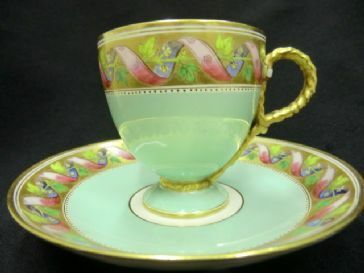 The wealthy were eager to buy items that befitted their position and best showed their wealth through their ability to drink this expensive ‘tea’ from beautiful vessels. By the 1740's a formula was discovered for making a ‘soft paste’ type porcelain and English manufactures could at last produce items to compare with the Chinese market. Factories started to open in London, Worcester, Derby and Liverpool, all producing teapots and coffee pots and the accompanying cups and saucers, to meet the growing demands. Many of the designs and patterns used were in imitation of their Chinese counterparts. The price of tea, and taxation, remained high and brought about the smuggling of tea into the country. It was only in 1784, when William Pitt the younger cut taxes from 119% to 12.5% that tea drinking became something more of English society could afford to indulge in. Improvements in the production of porcelain continued. 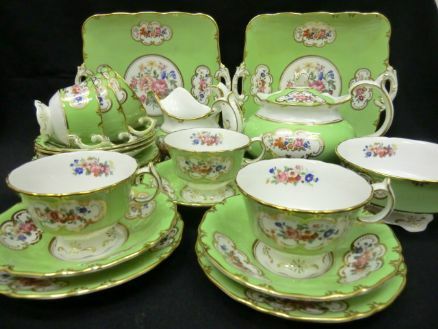 In 1791 the East India Company abandoned the import of Chinese porcelain, leaving a gap in the market and with this came the opening of many more factories to meet the demand for teaware, particularly in Staffordshire. By 1815 a hard paste porcelain had been produced which included the use of calcined animal bones to give strength to the fine, white ‘bone china’. The number of factories rose from 27 in 1780's to 106 in 1815. The English custom of ‘afternoon tea’ was introduced by Anna Russell, Duchess of Bedford (1783-1857) who decided that the gap between ‘luncheon’ at midday and ‘dinner’ between 7.30 and 8p.m. was too long and instigated the very English habit of taking tea and light refreshments in the afternoon. This became not only time for refreshments but also one for socialising, and an opportunity to get out the best ‘china’! 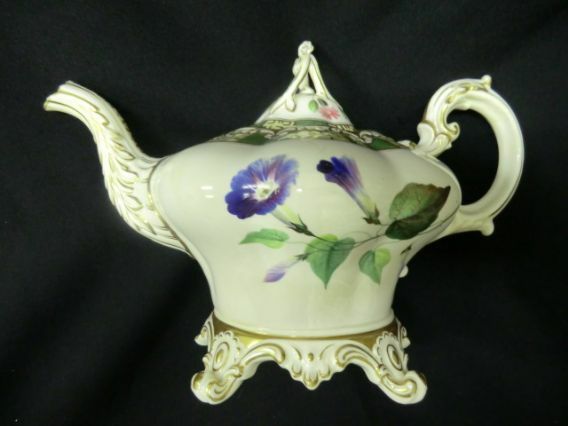 Through the passing years the styles of teapots and the accompanying cups and saucers, milk jugs, creamers, sugar bowls, sucriers, plates and comports evolved and changed in shape. Patterns came into, and went out of fashion, some revived years further on. 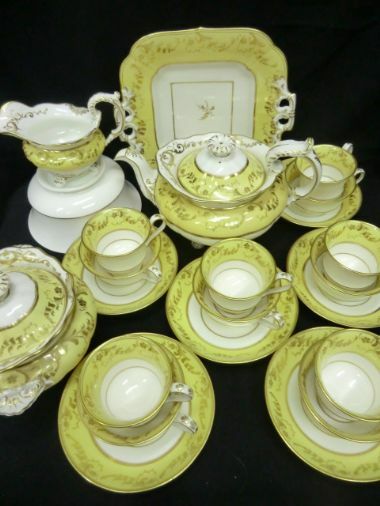 Early services might have consisted of tea and coffee pots, teapot stand, milk/cream jugs, lidded sugar bowls, saucer dishes, spoon trays, slop bowls, teabowls and coffee cans OR tea cups and coffee cups (the coffee cups traditionally slimmer and taller than the teacups) and only ONE saucer for each duo of teabowl & can OR tea & coffee cups. For this reason many cans, bowls and cups are to be found with no accompanying saucer. 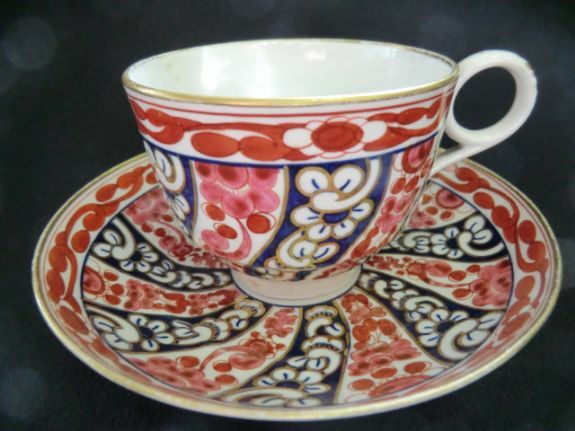 Manufacturers perfected the arts of underglaze painting, on glaze decoration, transfer printing, gilding, and embossing these beautiful tea services until they became works of art in their own right. If money was no object then the sky was the limit when it came to decoration and the latest style. Each passing decade would see the arrival of new shapes and patterns- the latest 'must haves'. Makers kept their own pattern books, but none seemed to worry too much if their 'latest' pattern was almost an exact copy of another factory, nor did it seem to matter from where replacement pieces were purchased and for this reason some services have items made by different factories! Anything could be achieved at the right price. 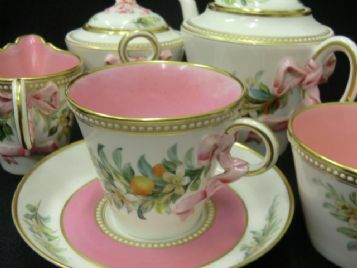 Of course the not so well to do could also afford a pot of tea occasionally and they were also catered for with more simply designed and patterned services in pottery or porcelain. The British had established tea growing in India around 1834 and by 1888 the imports from India were larger than those from China. By 1851, the English were drinking 2lbs of tea per head per year. And by 1901 that had risen to 6lbs per head. Tea was here to stay...and so were the customs that sprung up around it....at least for a while. Tea gardens became popular places in which to drink and be entertained outdoors, tea shops were a haven for unaccompanied ladies who could at last meet without the need for a chaperone, and tea dances, a chance to sip tea and glide round the dance floor, were still popular in the 1950's. Although those elegant tea parties of previous generations are, in the main, consigned to the past, we are very fortunate that thanks to all those manufacturers along with their hardworking, dedicated and incredibly talented workforce, we have many wonderful examples of their craftmanship. We can pick up a cup, ponder its beginings, appreciate its functionality, admire its beauty and hold a piece of history in our hands.